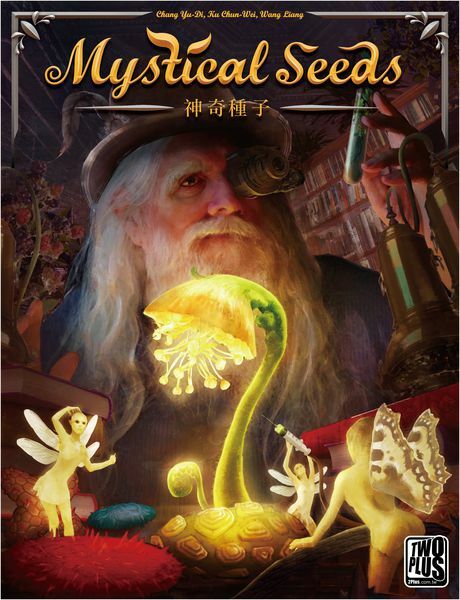 Mystical Seeds is a new resource management game coming out at SPIEL 2018. I was sent a preview copy, and while I’ve only played it twice – given the time crunch prior to the show, I thought that I’d go ahead and write it up now. 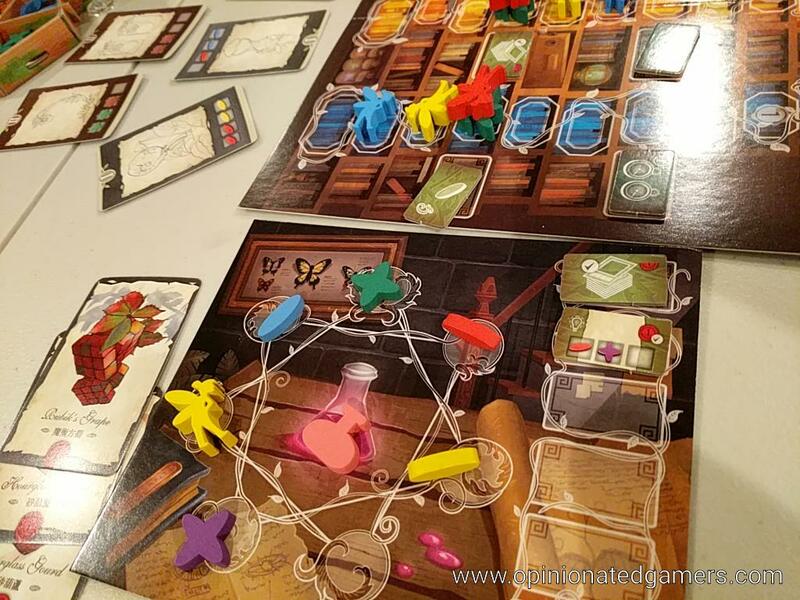 The game is one of resource management, players are trying to mix/match/graft together the seven different mystical seeds in order to gain prestige. The seven different seeds are placed in the garden. The three Level 1 seeds (ovals) are found near the indentations in the exterior. At the start of the game, one of the Fairy markers is placed in each indentation. Between each of these are the cross-shaped Level 2 seeds. Finally, in the middle are the star-shaped Level 3 seeds. 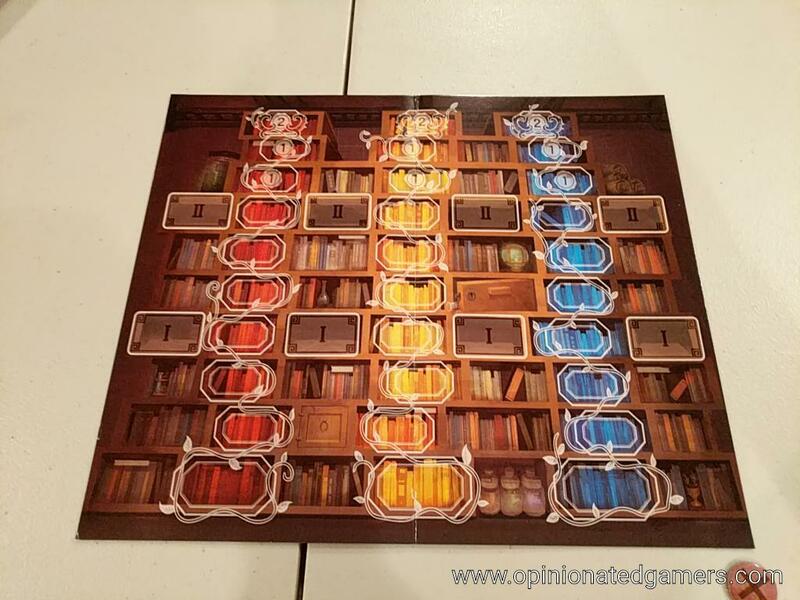 Each player also gets a player board which has a Lab area with 7 spaces on it. 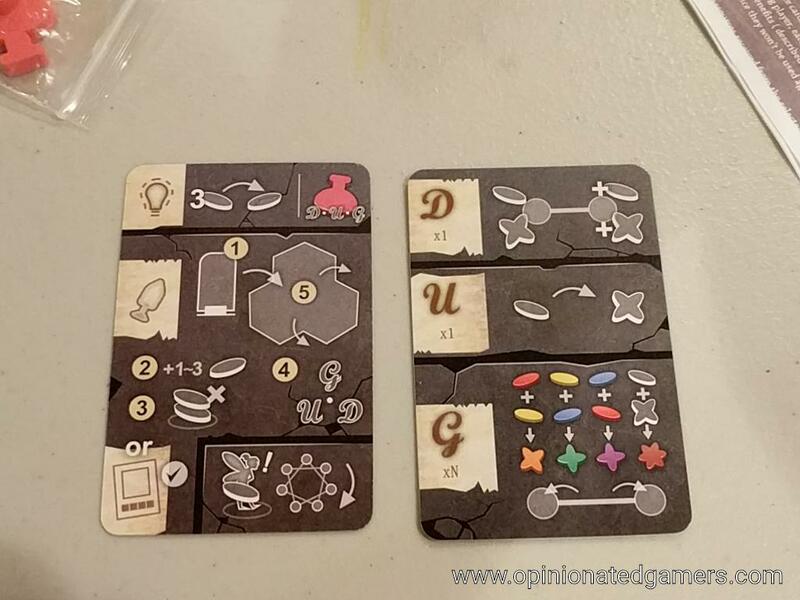 At the start of the game, each player is given a card with some starting resources on it. There are placed counter clockwise around the circles from the fairy marker that starts there. Each player also gets a Potion marker to start the game. There is also a Bookshelf board which has three knowledge tracks. Each player puts a marker at the bottom. Some starting cards will award progress on one or more of these tracks. Knowledge tiles are placed about a third of the way up (level 1) and two thirds of the way up (level 2). There are also plant cards in 2 levels; these are shuffled and three from each deck are dealt out in a display. Play goes clockwise around the board until the endgame condition is met (someone has 10 VPs). On a turn, there are three phases that are all done by the active player before the next person goes. In this phase, you can freely exchange any three identical seeds for any Level 1 seed of your choice. You can also use a potion to take a DUG action. [More on DUG actions in the Action Phase]. You have two options here – either collect seeds and take a DUG action OR cultivate a plant card. Collecting seeds – first you choose one of the three fairy markers and put it on its side. Then, take a number of Level 1 seeds (from the bin which the fairy marker is closest to) equal to the total number of fairy markers at that location. These seeds are placed onto you Laboratory board – starting with the space of the Fairy marker and going clockwise. Each circle can only have one seed, so if you are placing a second in a circle; one must be discarded from that space. Then take a DUG action (see below). Finally, move the fairy to either of the two other locations and stand it upright. D – Duplicate – select a Level 1 or 2 seed in your Lab and take an identical seed from the Garden. It must be placed in a circle which is connected by a line to the original. Remember, each circle can only hold one seed. U – Upgrade – select a level 1 seed and upgrade it to a Level 2 seed. Each Level 1 can be upgraded to either of 2 directly adjacent seeds in the garden. G – Graft – graft together any 2 seeds which are connected by a line in your laboratory. Two different Level 1 seeds will combine into the Level 2 which lies between them in the Garden. Any Level 1 combined with a Level 2 will create a Level 3 seed. The newly created seed goes in either of the two spaces vacated by the original seeds used to graft. Cultivating plant cards – to cultivate a plant card, you trade in a matching set of seeds as pictured on one of the six cards in the display. A level 3 seed can substitute for anything. A Level 2 seed can substitute for either of the two Level 1 seeds needed to create it. Advance along the corresponding knowledge track as shown on the card – you move one space on each track per seed shown – note that you move based on what is on the card, not based on the seed you used. A level 2 seed allows you to move along either of the two colors which created it. A pictured level 3 seed allows one space on any track. If you move into a space that has a knowledge tile next to it, you can take one of the tiles which is directly adjacent. Place it on your board in one of the 6 available spaces. These tiles have special abilities – sometimes instant effect and some are ongoing. Also note that once you are in the seventh or eighth spaces on a track, you score 1 VP for that track. The ninth and final space in each track can only be occupied by one fairy, and that space scores 2VP for the track. Keep the plant card in front of you – you score VP according to what is shown on the back. If the Fairy marker on your lab board is in a circle which also has a seed in it, move the Fairy clockwise until it is in an empty circle. If there are no empty circles, the Fairy simply does not move. Make sure to replenish the plant cards to the full complement of 6 as well as replacing any Knowledge tiles that were collected. Once a player has finished all three phases, the next player goes. At the end of a round, check to see if any player has 10 or more VP. 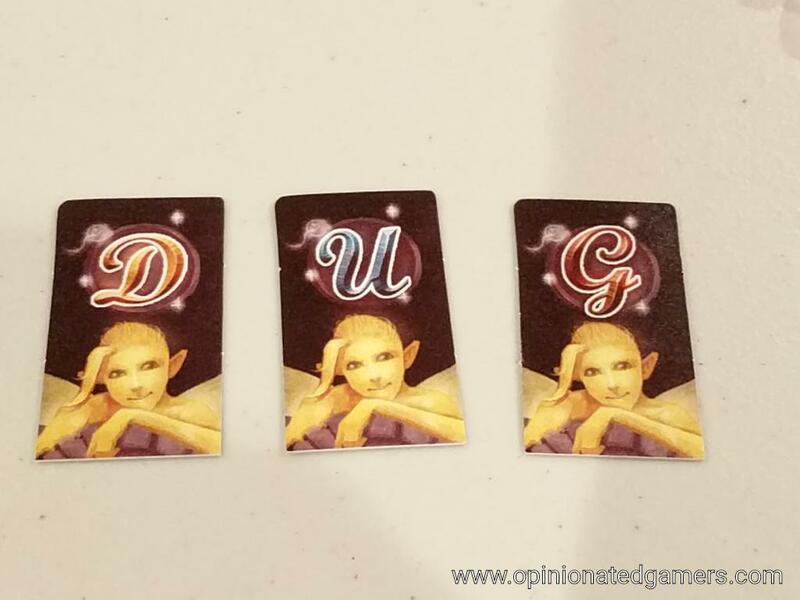 If so, the game ends and the player with the most points wins. 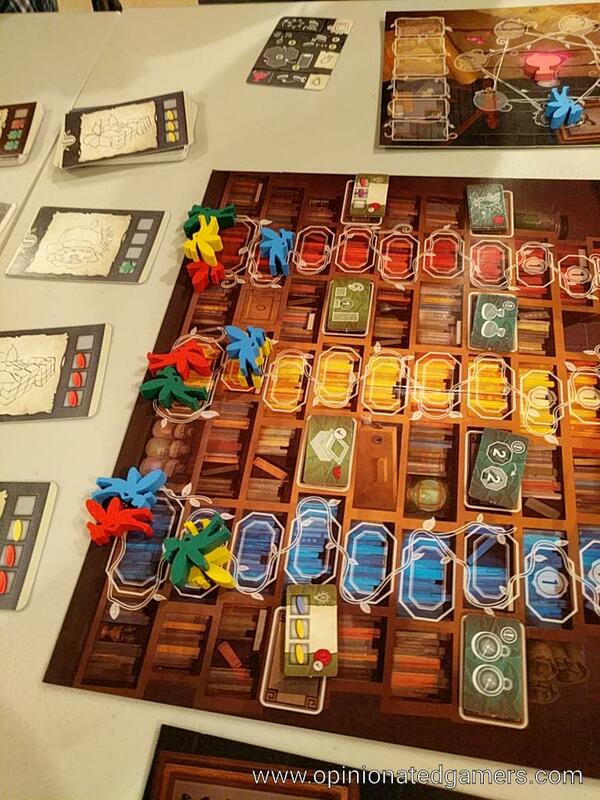 If there is a tie – the tied players count up their plant cards, knowledge tiles and starting resource cards that have VPs on them. The player with the fewest of those is the winner. Our first game took about 75 minutes, which seems a bit long, but there was plenty of first-game delay. I could definitely see this coming in closer to 45 minutes once everyone is familiar with the game. As we were going thru the first play, we all thought it was going quite slow at the start – at the half hour mark, I think the highest score at that time was only 3VP, and we were all worried that we were looking at a 2 hour game. However, as we discovered, the trajectory of the game gets quite steep near the end. The Level 2 knowledge tiles give great benefits which really increase what you can do on a given turn. Additionally, we found that players were able to have 4, 5 or even 6 point turns at the end of the game! For instance, you might start a turn and claim a previously collected level 1 tile in your inspiration phase. This might bump you up on a track, and now you are scoring 1VP for that track. Then, in your “real” turn, you complete a 2pt card, and the track movement here allows you to pick up a knowledge tile which is also worth VP and perhaps reach a scoring space on that track as well…. 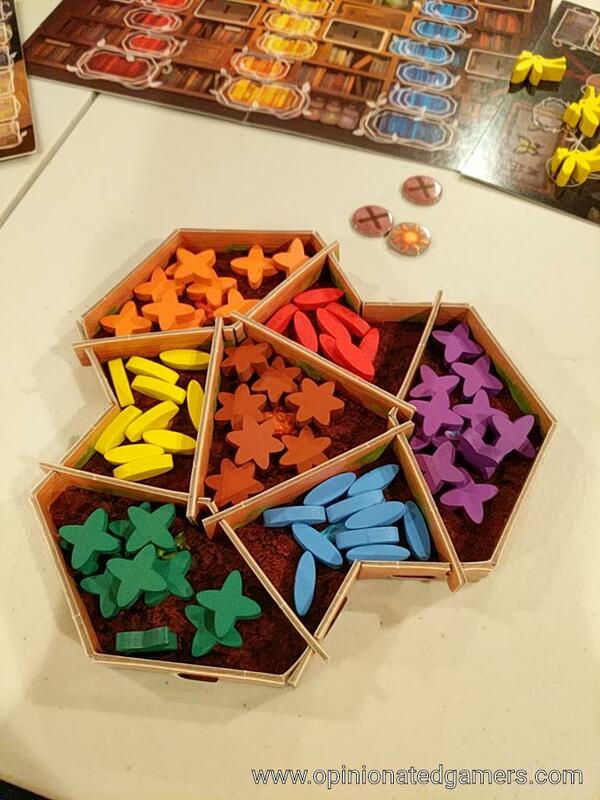 I do have one quibble with the components – it’s super confusing to have player colors exactly match those of the seed colors. We had to make sure that we were being super careful when calling out track advancements as we made some errors early on… I would hear “move up 2 on the blue track and one on red” – and sometimes move a blue fairy up 2 and a red fairy up 1 INSTEAD of moving John’s green fairy up two on the blue track and his green fairy up 1 on the red track. I understand that it’s hard to avoid duplicates when the seeds themselves rely upon the color wheel and primary/secondary/tertiary relationships – but perhaps white/grey/black/natural would have been better choices for player color to avoid this. In the end, it’s not a deal breaker by any means.. but make sure you don’t score the bookshelf tracks incorrectly because every space matters there! Thus far, I like what I see. I’d love it if the game took half as long, and I think there is definitely the possibility for that with repeated plays. That probably won’t happen until the post-Essen glut of games, and we’ll probably report back after those plays to see how the game improves (or not) with repeated plays. Joe Huber (1 play): While I can certainly see the positive that Dale sees in the game, for me there are a couple of issues that negatively impacted my experience beyond the component issues Dale mentions. First, there are parity issues – while more seeds aren’t always better, they generally are – and the number of opportunities players have to collect multiple seeds don’t balance over the course of the game. There’s also a potential frustration factor – it’s generally easy for a player to deny the next player the color they most need. Now, there are some reasonable workarounds for this, so it’s not a fatal flaw, but it’s still not ideal. The biggest issue, though, in my opinion, is the large differences in the awards at each level. This might not be such an issue if players started on level footing – but they don’t, due to the limited choices of starting positions. Overall, it’s a good effort – but as things stand, not for me. Dan Blum (1 play): I generally agree with Joe’s take. It worked well enough but there were too many rough edges and too few interesting things going on. The plant illustrations and names were the best part, honestly, although the game certainly works.